My visit to Gourdough’s was part of the Central TX BBQ Run. Well, after our wonderful meal from Odd Duck, the trailer court on South Lamar still had more to offer. 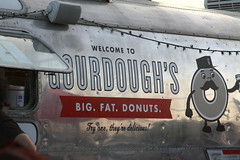 Next door to Odd Duck is a shiny Streamline trailer sporting a logo for “Gourdough’s Big Fat Donuts”. 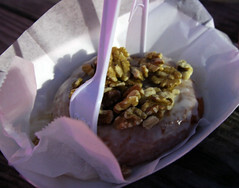 Gourdough’s is well-respected in the in Austin area as a donut vendor (500+ reviews on Yelp, average rating 4.5! 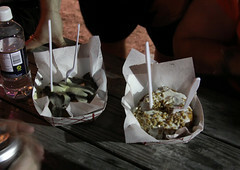 ), serving up some deliciously crispy and fresh donuts with some very intriguing toppings and fillings. There are two things that Gourdough’s has going for them. The first is the donuts themselves. They’ve obviously got the basics of donut making down, since the donut itself is pretty much a perfect example of a crispy donut. Everything about the donut was perfectly done: the texture the perfect blend of “doughy”, “fluffy”, and “crispy”. It’s like having a fresh Krispy Kreme right out of the oil, except, well, better. After perusing the very complete menu of inventive toppings (including the “Mother Clucker”, a donut with a chicken tender and honey butter, but they’ll make up just about anything that you can think up with, if they have the ingredients), I settled on the “Sailor Jerry”. Basically a very crispy and doughy (like KK, but even better), drenched with some rum sugar glaze and toasted sugared walnuts. Basically, think “Donut” meets “Rum Cake”, and you’ve got the idea. This also the second best donut I’ve ever had (keep reading…). Really. Crispy. The glaze spot-on, with more than a little rum. And the nuts were so delicious everyone else at the table was nabbing them. But I wasn’t the only one to indulge. My friend Brad bought a second round of donuts, buying a Mama’s Cake and Bring the Heath (I didn’t actually try the latter, due to lack of stomach space). The former is a donut filled with yellow cake batter with chocolate fudge glazing. Remember in the last paragraph I said that my Sailor Jerry was the second best donut ever? This one beats it, by a slight margin. The filling had that perfect “yellow cake batter” texture. The glaze was delectable. The crispy donut tied it all together. And I agree. For the first of many times this weekend, I also suspected that having heroin as an ingredient is the only way something could be this good.